Invertebrates and fishes that live in close association with them need good water quality... Will your skimmer help? Amblyeleotris guttata (Fowler 1938), the Spotted Prawn-Goby and Alpheid partner. BGA and Skilter adjustment questions (revisited) >Hi, >>Hello again. >Thanks Marina, for your answers. Here are just a couple of clean-up questions, if I may ... >>Of course. >(Oh, cool April fool pic yesterday, btw ...) >>April Fool's? Uh oh! 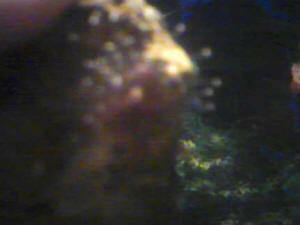 Ok, if you're talking about that seahorse with the sea monkey (my av) riding it, I have no idea where that came from! > >I have a skimmer question, but vital statistics first:-20g-"long" tank, (i.e. shallow) cycled but still maturing at about 2 months old, 1/2" "live" Arag reef sand (before I knew live sand wasn't), about 15lb LR, 1 x Natural daylight 17W NO tube and 1 17W Actinic, giving around 1.5 effective W/g. Skilter (w/Walsh mod), additional CAP200 powerhead, and temporarily a Magnum HOT for added circulation. > >>Eck.. Skilter, eh? >Yeah, well, the noise is comforting, in a way ... ;-) >>LOL! > >One tomato clown with his buddy, a green tip (in Actinic light, anyway) long tentacle anemone transplanted from my 37g FOWLR, and 1 blue damsel. Ph 8.3, temp 77, Ammonia & Nitrate close as dammit to zero, Nitrate coming down from around 50 to around 12.5 and still falling, Red Sea Phosphate test kit shows same color as new water - very pale yellowy green, but no color that is actually on the test card! > >>If you're getting readings at all of ammonia and nitrite, then your tank is not actually cycled, it's still in the process. >I'm not. I'm sorry, I misled you: I meant that Ammonia and Nitrite are indistinguishable from 0 using the "Tetratest" test kits. >>Ok. I had seeded the tank with very mature live rock, so cycling didn't take long, but it has definitely cycled :-) >>Great, so at least that's not a worry. >Nitrate is now WELL less than 12.5, and continuing to decrease with daily water changes. >>Even better! > >C. sertularioides (sp?) > >>? >I meant Caulerpa Sertularioides. >>AHA! > >I added a month ago is growing amazingly fast. > >>Ok >My macro algae is also taking off like crazy - is that due to the reduced Nitrates? >>A bolting macro is telling you (like anything else, really) that it's getting all the food and good environmental conditions it needs. It may be what's consuming your nitrates, too. If it's pretty, your LFS may want to take some harvest in trade for store credit. > >I got a purple BGA attack a short while ago ... <clip> > >>Alright. Although, you should know that it's more likely that your high nitrate readings could just as likely be the cause. See here--> http://www.wetwebmedia.com/bluegralgae.htm >Got it, thanks! >>You're welcome! > >The BGA is turning from purple to dark brown. Can I assume I'm winning and that it is about to collapse and will require rapid water change etc. to prevent toxic damage? > >>Not necessarily "rapid", per se, but frequent. >Yeah, frequent, that's what I meant :-) >>Ok, then we're both on the right track. >But is the change of color a meaningful indicator? >>Aaahh...interesting question. You know, I don't have the answer for you. As I understand it, when we see a change such as color or form, it could be indicative of the advent of a new species, or subspecies. If anyone else on the crew has the answer to this question, please chime in! <Skimmer discussion skipped> >I stirred things up in the tank to break up the red/brown "mats" of BGA on the LR, sand, etc, after which I got "weak tea" in the skimmer for an hour or so. I'm also playing with airstone positioning on the Skilter to get the best out of it. >>Do the best you can. >Can I restate my green filamentous algae question ? Will the green hair algae go away naturally, or do I need to scrub? I do have macro algae growing quite well now, and I don't want to destroy that, but I want to get back to plenty of coralline like my other tanks. >>Well, if it's doing well as is, and you want the other macro(s) to win the upper hand, then yes, you'll have to harvest. > >Last question: Because it's a shallow tank, the actinic and regular lamps don't mix well, so I swap the lamps front to back every couple of days to hit the LR at the back and the anemone and Caulerpa in front. > >>Not sure I understand what you're saying. >I meant that whatever bulb is in back, lights up the back, what's in front, lights up the front. The tank is so shallow the light doesn't mix back to front like it would in a deeper tank. >>Ok, thanks! > >>Live rock doesn't need lighting, your anemone does. Also, actinics aren't a necessary component of lighting, they are more for aesthetics. Look here for information on lighting--> http://www.wetwebmedia.com/marlgtganthony.htm >Excellent document, thanks. >>That Anthony guy surely knows his stuff. ;) >I guess from your answer and from the link, I should just put the same lamps in front and back, but selected for the anemone, which really means forget the Actinic in favor of full spectrum, unless I upgrade to PC. I'll try to get financial approval for that ... >>LOL!! Spoken like a true husband (or at least s.o.)! Yes, that would be the course of action suggested. Remember, good reflectors can do a LOT to help spread the light, too. > >It is time to replace the wide-spectrum lamp. As I eventually want to end up with a Walsh-style nano-reef with a little soft coral, should I just go to all 50/50's, or just get a 10,000K for the anemone for now, keep swapping, and change to PCs when the tank is mature? Many Thanks! > >>What you first need to do is decide what you *really* want to keep. Putting in animals such as soft corals and leathers in a tank (*especially* such a small tank!) with an anemone is a bad idea. >Aha - good to know. Thanks for that ! >>No problem. > >>If you want the anemone, then keep it just to that. It could (with good husbandry) soon outgrow that 20 gallon, too. If it does, then you move it to its own tank (50gal or larger) then you can consider the corals in the 20. >I'll put it back in the 120g I'm planning, when my ship comes in ;-) >>Great plan. Let's hope it's one of those Princess Cruise Line ships...or better yet, a Windjammer Barefoot Cruise! >I really need to properly identify this anemone now, so I can determine its lighting needs. It is around 4-5 inches diameter, including tentacles around an inch or so long, green tipped at the ends when viewed in Actinic light, but otherwise an off-white color with pink/purple coloration in the main body and tentacles. It is paired with a tomato clown. Could you suggest a reference site with pics? Thanks! Julian. >>Hhhmm...I haven't got anything more than what's on this site at the moment. Look here--> http://www.wetwebmedia.com/marine/inverts/cnidaria/anthozoa/anemones.htm There are links to many and all things anemone to be found on the WetWeb. Tanks for the update, Julian! Marina.